Keep forgetting where you put your keys? Wish you could get through the crossword faster? Experiencing too many "intellectual pauses"? Then this is the book for you. For aging baby boomers -- and for anyone else who wants a quicker wit -- Brain Candy has all the answers. We got the idea for this book when one of us -- Ted Lidsky -- developed an aching, arthritic back. As I was unable to get more than partial symptom relief from aspirin, ibuprofen, and acetaminophen, my treating physician suggested an alternative: St. John's Wort. (For reasons that are poorly understood, drugs that are normally prescribed for depression will, if given in very low doses, alleviate certain types of chronic pain.) This herb, now so well known, was unfamiliar to me at that time. My doctor explained that it was a naturally occurring antidepressant that should, like the prescription antidepressants, be effective in treating chronic pain. It was effective; after a few days of taking St. John's Wort, I had better pain relief than I was able to get from ordinary painkillers. At about the same time as my back pain let up, however, I began to develop a new problem that was even more disconcerting: I began to have increasing trouble speaking. In fact, I had great difficulty thinking of the simple words that were part of my normal vocabulary. My speech repeatedly stalled as I racked my brain to find words that seemed to be right on the tip of my tongue. Since part of my work is public speaking, it was a definite handicap. In searching for the cause of my jumbled words, I stumbled back upon the St. John's Wort, since it was the only recent change I had made in my life. Yet neither the physician who suggested that I use the supplement nor the "authority" in the health food store where I bought it nor the many magazine and journal articles describing St. John's Wort's effects mentioned adverse influences on speech. Still, I could think of no other explanation, and so as a test, I stopped taking the drug. Miraculously, as my back pain reemerged, so did my ability to find words. I started the St. John's Wort again, my back pain lessened and my speech problems returned. Clearly this was a side effect of the drug that, based on the available information, was impossible to foresee. Some time after I stopped taking St. John's Wort (for good, this time), I noticed a television commercial for an herb that was touted as being useful in fighting off the effects of aging on memory. Like millions of others in my age bracket, I have noticed a decline in my mental powers as I've grown older. Is it possible that the advertised herb, or any of the other cognitive boosters that are aggressively marketed, actually work? Are they safe? My experience with St. John's Wort, particularly in attempting to get information about its side effects, made me wary. What were, really, the benefits and potentially dangerous differences between prescription drugs as compared to the herbs, dietary supplements, and other agents sold in health food stores and other sources of alternative medicines? While it is fairly easy to obtain exhaustive information about the actions and side effects of prescription drugs, it is difficult and often impossible to get similar information about alternative medicines. I shared my thoughts with my coauthor, Jay Schneider, and together we came up with the concept for this book: to provide unbiased, well-researched information for those people who are considering the benefits and risks of herbs, dietary supplements, or other approaches to improve their mental functioning -- brain candy, so to speak. It is intriguing that despite the questions about alternative medicines, dietary supplements, and herbs, the sales of these products is a multibillion-dollar business. Why, in the face of so many unknowns, are people so willing to buy and take these substances? Since many of us are either baby boomers or the children of baby boomers, perhaps one consequence of our experiences through the sixties and seventies, is a tendency to gravitate toward "natural" solutions to our problems. There is not a one of us who hasn't been appalled by the price of prescription drugs. In fact, the more we hear about hospital screwups, misdiagnoses, and harmful treatments doled out by physicians, the less we trust the traditional medical and pharmaceutical establishment to cure our ills and fix our problems. Many of us equate "natural" with "good" whether referring to the food we eat or the drugs we take, yet some of these products may be poisonous or harmful. However, we can't overlook the reality of these herbs finding their way into our daily diet through addition to snack foods and drinks. This movement has so permeated our culture that products such as iced tea spiked with gingko and other herbs are common sights on supermarket shelves. The problem is, our yen for natural remedies to treat our waning mental capacities or prevent their eventual decline can put our overall health at risk. There are many people who will tell you that there is nothing wrong with taking herbs or combinations of herbs to fix your memory or lift you out of a funk. Many of them are sincere and many are not. Some of these advocates either have an equity stake in companies selling these items or, more ethically appalling, sell these products themselves. The truth is, some remedies available today may cause serious adverse effects such as dangerously increasing blood pressure and altering heart rhythm, life-threatening allergic reactions, kidney and liver failure, and may even be carcinogenic. There is growing evidence that even the most popular remedies out there, St. John's Wort and gingko biloba, may have dangerous interactions with various prescription drugs. In fact, the American Society of Anesthesiologists recently issued a warning to consumers using herbal remedies to stop taking them at least two to three weeks before any scheduled surgery due to dangerous and life-threatening interactions of some of these remedies with the drugs used to anesthetize patients during surgery. For example, gingko biloba, garlic, ginger and ginseng may prevent blood clots from forming and lead to excessive blood loss during surgery, while St. John's wort and kava-kava may prolong the sedative effects of anesthesia. So, who is going to protect us from potentially harming ourselves as we try to find the magic elixir for forgetfulness? Our legislators in Congress? Not likely. In 1994, Congress passed a law, the Dietary Supplement Health and Education Act, that distinguishes between products that claim to "affect the structure or function of the body" and those that claim to prevent, treat, or cure disease. Thus, dietary supplement manufacturers (who have a very effective and powerful lobby in Washington) can market their products without any safety or efficacy testing as required of a pharmaceutical agent, as long they don't make claims related to disease. What about the Food and Drug Administration? This is equally unlikely. The FDA recently eased restrictions on dietary supplements (herbal remedies are classified as dietary supplements), saying these products can legally claim to treat various symptoms, such as age-related memory loss, that are considered to be common passages of life. This of course was good news for the $6 billion-a-year dietary supplement industry (and personal injury lawyers), but bad news for consumers. In 1997, the President's Commission on Dietary Supplement Labels recommended that the FDA appoint a committee to evaluate the safety and effectiveness of dietary supplements, but at this time there is no effort under way at FDA to change the manner in which the agency reviews or regulates homeopathic preparations. The truth is, the $6 billion worth of dietary supplement pills, capsules, teas, and elixirs used by U.S. consumers each year undergo absolutely no government or industry scrutiny for safety and effectiveness before reaching the store shelves. There are also no manufacturing standards to insure the quality of the product that you are buying. There is no way for you to know if that bottle of kava kava you just bought really contains what the label says it does and that it is free from harmful contaminants. If this scares you, it should. It scares us. And that brings us to this book. Dietary supplement manufacturers are going all out to attract consumers who are otherwise healthy individuals who are experiencing normal age-related changes (these often begin your forties) in their memory and concentration abilities. Forgot the name of the guy you were introduced to a few minutes ago? Forgot where you left your car keys? Middle-age forgetfulness can happen to all of us occasionally and as the population ages (the number of people over age sixty-five will double in the next thirty years), the market for supplements that counteract these cognitive changes will grow. The purpose of this book is to provide you with some objective information about the safety and effectiveness of a wide variety of potentially brain-altering compounds so that you can make educated decisions about whether you want to use them, or not. 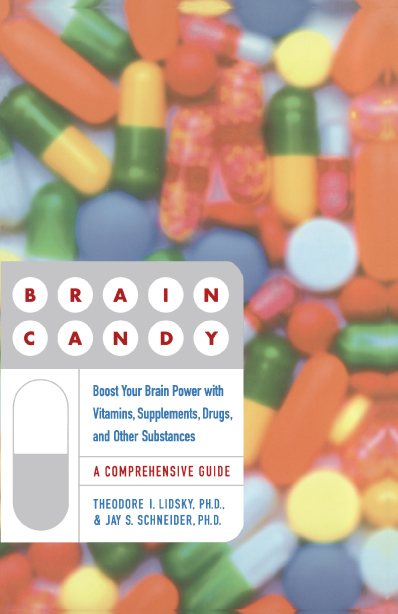 Brain Candy is organized into chapters that explain how the effectiveness and risks of drugs are evaluated (Chapter 1), the many environmental and biological factors that affect your ability to remember (Chapter 2), and how the brain stores information (Chapter 3). The remainder of the book discusses the variety of herbs, drugs, and hormones that are either available now (Chapters 4 through 8) or are being investigated in the laboratory (Chapter 9). The plain facts summarizes the information about the compound and, if there is sufficient information on which to base a decision, makes a general recommendation. In addition, to help in the decision-making process we have rated each compound for potential benefits and risks. Benefits are rated on a 6-point scale with 0 being no benefit and 5 considerable benefit. Similarly, risks are also rated on a 6-point scale with 0 indicating no known risk and 5 maximum risk. Risks in the range of 4 or 5 are unacceptable no matter how great the benefits. Although we have attempted to provide a list of contraindications for the drugs described throughout the book, the following should be noted. Only specific conditions that contraindicate the use of a drug are noted. It should be understood that for each entry, a specific allergy to that drug is a contraindicating condition. Unfortunately, the actions of many of these substances have not been sufficiently documented to enable a comprehensive list of possible risks, adverse reactions, and contraindications. In particular, for example, the effects of the majority of these compounds on pregnancy, the developing fetus, and children have not been studied; therefore these substances should not be taken when pregnant or be administered to children. Prudence and common sense must be used and a discussion with a competent health professional is strongly recommended before embarking on a course of dietary supplementation. Ultimately, when it comes to the use of dietary supplements to treat age-related cognitive decline, you need to be an educated but wary consumer. There are some good reference books -- for example, the American Pharmaceutical Association's Practical Guide to Natural Medicines and the Physicians Desk Reference for Herbal Medicines -- that you can go to for information on a wide variety of substances. The Internet can also provide a wealth of information on supplements, medications and health conditions. A reference book like The Doctor's Always In, which we published in 1999, can help you zero in on useful sites and save countless hours of search time. When searching the Internet for medical or drug/supplement information, remember that there is no mechanism in place to monitor Internet health sites or businesses to control for deceptive or false claims and practices. Just because information is easily accessible on the Internet doesn't necessarily mean that the information is good. Know who's responsible for the site. Sites posted by government agencies (.gov), universities or other educational institutions (.edu), and reputable organizations (.org) usually contain the most useful and reliable information. Be wary of commercial (.com) sites. While many commercial sites do provide useful information, be wary of sites that seem to be hyping a product and that provide superficial information in their unabashed attempt to sell you something. Check for the currency of the information and the credentials of the individual(s) posting the information. Is the information current and up-to-date? Is the information posted by someone with medical or scientific expertise? Are individuals with science or medical expertise consultants or advisors to the site? Are the sources of the information listed, and do they appear to be authoritative? Beware of outlandish claims and testimonials. Always remember: if a product seems too good to be true, it probably is. We are not advocating the use of any compounds, nor are we putting a blanket rejection on all dietary supplements. We are merely presenting you with best and most objective information available on the safety of the various compounds listed and the real scientific evidence (if it exists) to support the use of the supplement. The final decision on whether to use or not use any particular item is yours alone. We hope that you find this book useful.